Dogs. Less commonly, cats can develop hip dysplasia, but the symptoms are much less threatening. Difficult to prevent and treat, canine hip dysplasia is among the most studied and the most frustrating diseases in veterinary medicine. Canine hip dysplasia is a developmental orthopedic disease in which an abnormal formation of the hip leads to looseness in the hip joints, causing cartilage damage. Progressive arthritis can result, and when it does, it can be crippling. 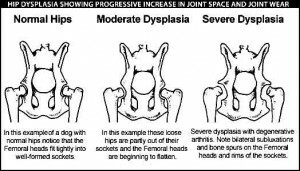 Hip dysplasia is not the same thing as arthritis in Hip dysplasia is not the same thing as arthritis in the hips rather, it is the most common cause of arthritis in the hips. Some dogs will show clear signs of hip dysplasia at a very young age, before the arthritis sets in. For them, a commonly used surgical method is available to prevent its onset. But for many canines, the symptoms will not be obvious until severe, crippling arthritis has developed. At this point, the options for treatment are limited and complex. 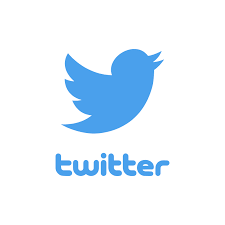 Decreased activity; difficulty rising; rear limb lameness; reluctance to use stairs, particularly to go up; reluctance to jump or stand on hind limbs; swaggering gait; bunny-hopping gait; pain from manipulation of the hip(s); decreased range-of-motion in the hips; crepitus in the hip joint; positive Ortolani sign; positive Barden’s maneuver; subluxation or complete luxation. Less energy and movement; difficulty rising; lameness in the back legs; reluctance to use stairs (particularly to go up); reluctance to jump or stand on hind limbs; swaggering gait, bunny-hopping gait; soreness after lying down; soreness after heavy exercise. Canine hip dysplasia is a developmental orthopedic disease. When a dog has dysplasia, it has an abnormal development of the ball-in-socket joint that makes up the hip. In a dysplastic hip, the ball (the head of the femur, or thighbone) and the socket (the acetabulum, a portion of the pelvis), do not fit together snugly. The result is a painful and damaging friction. When a dog bears its weight on the joint, the friction strains the joint capsule, which is a fibrous tissue that surrounds the joint and produces joint fluid. The straining then damages the cartilage and leads to the release of inflammatory proteins within the joint. Thus begins the cycle of cartilage destruction, inflammation, and pain the symptoms we associate with arthritis. Among animals with hip dysplasia, the onset of arthritis will vary. Some dogs will get it in early youth; for others, it may not present itself until much later in life. Frequently, two types of hip dysplasia are described: acute and chronic. The acute (early) stage, usually seen in young dogs, is characterized by intense pain in the hips and mild to severe lameness. This stage can last from weeks to months. 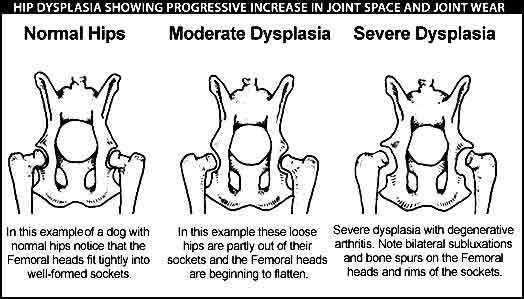 The chronic (late) stage of hip dysplasia is characterized by pain, decreased range-of-motion in the hips, and progressive arthritis. Chronic dysplasia can develop in dogs less than one year old or it can take many years to occur. Hip dysplasia is most common among larger breeds, especially the German shepherd, rottweiler, Labrador retriever, golden retriever, mastiff, Saint Bernard, and others. It can also be seen in smaller breeds such as the cocker spaniel and springer spaniel, as well as in mixed breed dogs. Cats suffer from hip dysplasia, too, but their symptoms are usually minor. puppies as young as four months of age. Other less commonly used methods of diagnosing hip dysplasia include computed tomography (CT scan), and ultrasonography. The prospect for recovery for non-surgical, or conservative, procedures is not clear-cut. It can be extremely difficult to predict which animals will develop severe debilitating arthritis, so it is always a risk to opt for conservative management instead of surgery. Surgery, of course, carries its own risks. The prognosis for dogs after a triple pelvic ostectomy is thought to be very good if the operation is performed before the onset of arthritis. When the arthritis has developed so that it is visible on an x-ray, however, this type of surgery has a considerably reduced chance for success. As long as there are no complications, a total hip replacement is very likely to result in a complete recovery from dysplasia. Complications, however, could necessitate the removal of the implants. The prognosis for femoral head ostectomy is generally good for smaller dogs, and guarded for large or obese dogs. Hip dysplasia is a legacy disease, passed through the genes. Chances are that a loose-hipped dog that mates with another loose-hipped dog will give birth to a dysplastic puppy. It would seem, then, that the solution would be simple: to reduce the incidence of the disease markedly, refrain from breeding two dysplastic dogs. But the difficulty in preventing, as well as treating, hip dysplasia is that not all dogs with hip dysplasia will show signs of the disease. Thus, many seemingly normal dogs are bred together, keeping hip dysplasia within in the gene pool. Environmental factors also play a role in hip dysplasia. For example, it is well known that obesity is a risk factor for the development of arthritis. In addition, dog food that has been over-supplemented with extra proteins, vitamins and minerals to make puppies grow faster can create orthopedic problems in extremely large breeds of dogs that may lead to hip dysplasia and arthritis. There are conservative, or non-surgical, methods for treating hip dysplasia, such as pain medications, weight loss programs, controlled exercise, and physical therapy. These methods can be very effective in certain cases. However, conservative treatments do have their limitations. The other option is surgery. There are two surgical approaches for dealing with hip dysplasia: prophylactic procedures, which are designed to prevent the progression of arthritis, and therapeutic procedures, which aim to treat or salvage already arthritic hips. The primary prophylactic procedure available is called a triple pelvic osteotomy. In this procedure, three separate bone cuts are made in order to free the acetabular component (the socket or cup) of the hip joint from the rest of the pelvis. The acetabulum is then rotated to provide better coverage, and a bone plate is applied to maintain this new position and allow the bone cuts to heal. This procedure is quite effective if it is performed before significant arthritis is present; after this time period, it is no longer a useful procedure. A veterinarian can assess whether the dog is a good candidate for this procedure. Another type of preventative surgery, currently under clinical investigation at several universities, is pubic symphysiodesis, a procedure for very young dogs that manipulates the way the pelvis grows to create a tighter hip. Studies are being conducted to help determine whether this procedure is safe and effective. Aimed at treating hips that have already become arthritic, the therapeutic procedures available for dysplastic dogs include total hip replacement, femoral head ostectomy, and investigational surgeries such as the DARthroplasty. In a total hip replacement procedure, which is generally performed on a severely debilitated dog weighing more than 50 pounds, a prosthetic hip socket and a femoral head are implanted into the dog, forming an artificial ball-in-socket joint. This gives the dog a pain-free hip joint and nearly normal function after the recovery period. Total hip replacement is a technically demanding surgery, and usually is done by highly trained individuals at referral practices and universities. When performed by experienced surgeons, the success rate approaches 95 percent; nevertheless, complications, while uncommon, can be devastating. For this reason, this procedure is reserved for animals with the most severe signs of hip dysplasia. Femoral head ostectomy is a surgery performed on severely arthritic dogs. With this procedure, the femoral head (ball part of the joint) is removed, allowing the femur to float about freely and causing scar tissue to form. As the scar tissue hardens and thickens, it serves to create a false-joint called a pseudoarthrosis. The femoral head ostectomy is a last resort procedure and generally is not recommended for mild cases of arthritis. This procedure is more effective in smaller, well-muscled dogs. Among dogs weighing more than 50 pounds, the results will vary. The DARthroplasty has been employed recently to treat hip dysplasia in young dogs. With the goal of relieving pain, this new surgical technique involves transplanting bone from the pelvis to the hip socket in order to stabilize the joint. Since controlled studies are lacking, and only a limited number of surgeons can perform this procedure, the DARthroplasty should be considered investigational until more information is gathered. With any treatment, postoperative recovery depends not only on the procedure, but also on the aftercare. The same principles of non-surgical therapy are applied following surgery: obese animals must lose weight and pain medications should be used when needed. Follow the veterinarian’s recommendations closely. Conscientious breeding is vital to decrease the occurrence of this devastating disease. Ideally, dysplastic dogs should not be bred together to prevent the disease from staying in the gene pool. However, it is not always easy to avoid breeding dysplastic dogs, since it is so difficult to detect hip dysplasia in dogs that do not show signs of arthritis. Careful breeding is of course the best measure of prevention, but for dogs born with the hip joint abnormality, the PennHIP x-ray technique shows promise in allowing an earlier and more sensitive detection of dysplasia. A carefully planned diet is also a good measure of prevention. Feeding large breed puppies over-supplemented, high-protein food in order to force rapid growth has been shown to increase the incidence and severity of arthritis in dysplastic dogs. 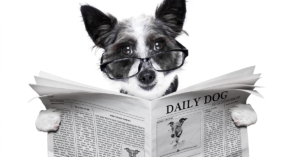 Dogs fed a calorie-limited diet will reach the same adult size as their overfed counterparts more slowly, of course, but with a considerably reduced likelihood of developing arthritis. Many pet food manufacturers are recognizing this and are producing diets that are tailored for large breed puppies. Consult with a veterinarian regarding specific diets and feeding schedules to minimize the risk of a dog developing arthritis from hip dysplasia. Many veterinarians recommend x-rays of at-risk breeds at approximately six months of age to screen for early evidence of hip dysplasia, before the onset of arthritis. An ideal time to do this is when the animal is presented for spaying or neutering because then it will be already under general anesthesia, which usually is necessary for taking appropriate x-rays of the hips. Male and female dogs at risk for hip dysplasia that are intended for breeding purposes should have their hips evaluated and certified by the Orthopedic Foundation for Animals (OFA) at approximately two years of age. A dog must be at least two years old before the OFA will certify the hips. Hi,I have a 5 month old puppy with a hip luxation on right side. His acetabulum is shallow and the surgeon is thinking of doing a DPO but states that it may not work. I feel that DARthroplasty would be the best option but I cannot find any surgeons that practice the surgery in the United States besides Dr. Luck in Denver, CO, who is now retired. I was wondering if you knew any Vet Surgeons that practice DARthroplasty. Thanks so much for your time.